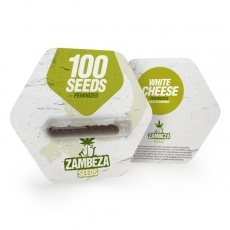 White Cheese Fast Flowering Bulk Seeds: Excellent Cheese Now With Reduced Flowering Time! Cannabis history tells us that the first Cheese variants had been bred in London, UK by a group of passionate growers. It was immediately clear that the new strain was something special because she had a very distinctive spicy "Cheese" flavour that was unlike anything else back at that time. Add her excellent production that makes the plant develop beautiful frosty-white buds that are covered in sticky resin it was only a matter of time until Cheese became a favourite strain for many, growers and smokers alike. We, at Zambeza, thought long how to make Cheese even better while keeping all her excellent qualities. With the help of always reliable excellent Skunk and Afghani genetics, we managed to create our White Cheese Fast Flowering where we reduced her flowering time to about 50 short days. This makes White Cheese Fast Flowering an extremely satisfying Indica-dominant strain that can now deliver her superb results in record time, excellent for all those who live in areas where the growing season can be short because of rain, like in the UK and other parts of Northern Europe. Thanks to her reliable Skunk and Afghani genetics, White Cheese Fast Flowering can easily be grown indoors or outdoors and she’ll otherwise not require any special growing skills. That being said, Cheese has a tendency to produce hard nuggets so that you want to ensure good air circulation to keep the risk for mould grow low. Indoors, she can reach heights of 60-90cm with respectable yields of up to 500-550g/m². If you grow her outdoors, White Cheese Fast Flowering can grow much bigger, expect 120-200cm in optimal conditions. Outdoor harvests can be a nice 500-600g/m² and don’t forget that she does all that in a super short 50 days! When you smoke White Cheese Fast Flowering, get ready for her trademark superb flavour that is spicy and fresh with the unmistakably "Cheesy" notes: This is a mouth-watering smoke that will make you want more of her with every single toke! With her medium-high THC content of 17%, she makes for a great “happy smoke” that is also very relaxing. White Cheese Fast Flowering is a superb Indica-dominant strain that improves on the already fantastic Cheese. This is a reliable strain with good genetics that shines with a short flowering time, amazing Cheese taste and great high so that you can’t go wrong when you grow this beauty. Our White Cheese Fast Flowering is available in packs of 100 seeds, great for anyone who wants larger quantities of this fabulous strain.